The company's recent stock price weakness isn't being accompanied by any deterioration in its fundamentals. Investors in Caterpillar Inc. (NYSE:CAT) will need little reminding that, as I write, their stock is down around 6.5% on a year-to-date basis. Given such a price move, it's a good idea to take a step back and examine whether the underlying fundamentals have gotten better or worse for the company. I think they've improved, and the recent move lower is making the stock more attractive. Here's why. There's little doubt that rising interest rates cause concern for equity investors -- higher interest rates make bonds relatively more attractive when compared to equities. For example, the U.S. 10-year Treasury yield was at 1.5% just last year but now stands at around 2.7%. Moreover, the Federal Reserve target funds rate has risen to 1.75% from 0.25% in 2015, and most investors are expecting more rate hikes to come, so there is definitely pressure on equities. Rising rates are usually in response to accelerating economic growth and go hand in hand with inflationary pressure. This is not necessarily bad news for cyclical companies like Caterpillar, especially for its construction-related sales. Much of the inflationary pressure has come from commodity prices, and rising oil and mining metal prices are good news for the company. As you can see below, Caterpillar's key commodity prices continue to move in the right direction. The beginning of an extended up cycle in mining capital spending? Caterpillar's resources industries segment (mining) is probably the key swing factor for its earnings in the next few years. 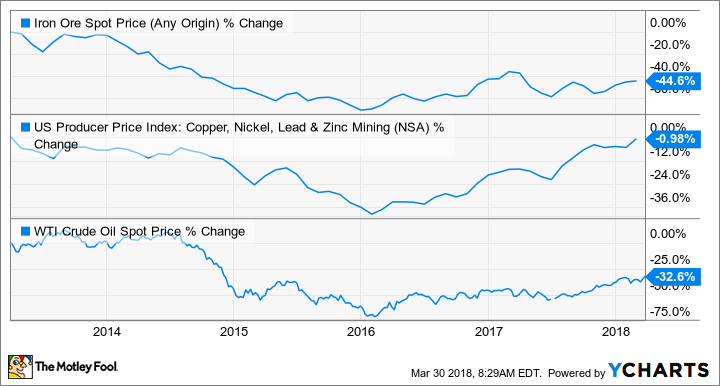 As you can see above, underlying mining metals prices are moving in the right direction, and the major mining companies expect their spending outlook to improve. Here's a look at four of the largest mining companies and their capital expenditure plans for 2018. The total of their planned expenditures for 2018 is around $21 billion, representing a near 20% increase over 2017. If mining metal prices continue to increase, then you can expect more growth in the coming years. Caterpillar's construction industries segment provided the majority of the company's profit increase in 2017, and the outlook for the industry is improving in 2018. Indeed, a look at Caterpillar's peer, Deere & Company (NYSE:DE), only serves to confirm this idea. While Deere is more of an agricultural equipment company, its construction and forestry segment outlook is highly relevant to Caterpillar. The good news is it looks set for a hefty increase in sales and profit in its fiscal 2018. For example, in its first-quarter 2018 earnings release in mid-February, Deere's management raised its full-year 2018 net sales growth forecast for its construction and forestry segment to 22% compared to a previous forecast of 14% (both figures exclude acquisitions and foreign exchange). Moreover, Deere increased its forecast for housing starts and total construction investment in the U.S. --both very good signs for Caterpillar. Deere is an attractive company in its own right, but its construction outlook is also good news for Caterpillar. The themes discussed above are all borne out when looking at Caterpillar's retail sales figures. As you can see below, resource industries sales are finally catching up with construction industries sales. No one likes buying a cyclical company at the peak of its cyclical growth, particularly when interest rates are rising. However, Caterpillar's upcycle appears poised to continue, not least from an improving outlook for U.S. construction spending and rising commodity prices. Meanwhile, if the cause of rising interest rates is mostly related to raw material price increases such as oil & mining commodities -- end markets that Caterpillar has heavy exposure too -- then it's reasonable to argue that Caterpillar is a net winner in this environment. All told, Caterpillar's outlook appears to be improving.